Preseason capsule information for the area’s girls soccer teams, as submitted by coaches. Outlook: It’s getting more and more difficult to remember a time when the Aggies weren’t defending a state title. 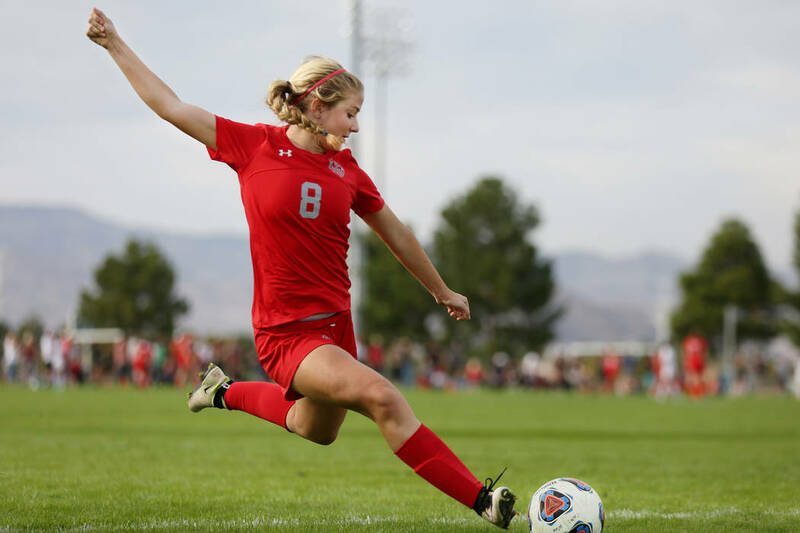 Arbor View won its fifth consecutive large-school crown last year and returns 15 letter winners from that squad, including three of the top four scorers in Erickson (26 goals, 8 assists), Ferrara (18 goals, 18 assists) and Larkin (17 goals, 12 assists). Niemann (11.5 shutouts) and Peters are back to guide the defense. Outlook: Johnson inherits a team with 12 returning letter winners and one that is hungry for success. “We want to build upon the things the team does well and be ready to compete,” Johnson said. Outlook: Losing three seniors who combined for 88 goals and 56 assists last season would decimate most teams. The Gaels, though, have reinforcements ready to step up. Terrana (16 goals, 16 assists) and Cox (6 goals, 7 assists) both were solid contributors last season, and the Gaels eagerly welcome back Rolley (10 goals, 5 assists in 2015) and Gourley (7 goals, 4 assists in 2015). “The return of two key players from the 2015 season will help lessen the scoring loss and strengthen an already deep team,” Borgel said. 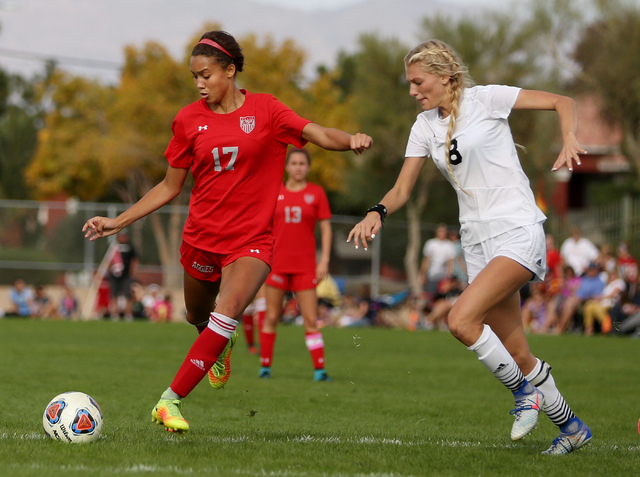 “While the 2017 Gorman soccer team won’t be quite as talented, they will be much deeper. Outlook: The Bulldogs return seven starters, including an All-Sunset Region honoree in Riddle and the team’s leading scorer last year in Brooks (18 goals, 7 assists). Bonds (5 goals, 3 assists) was third on the team in scoring last year. “With a great mixture of old and new faces, Centennial has a strong lineup for this season,” Kasten said. “There are strong forwards with powerful shots, commanding midfielders, a solid defense and great leadership in goal. Outlook: The Cowboys welcome back seven letter winners from last year’s squad and are hoping to show improvement this season. Outlook: The Desert Shields bring back six starters from a team that advanced to the Southern Region semifinals last season. Erives (26 goals), Borrero (11 goals, 4 assists) and Heard (9 goals, 10 assists) are back on offense. Gonzales is expected to be among the leaders on defense. “With the return of Class 3A’s third, eighth and 10th leading scorers and the return of the defensive player of the year, we have a good mix of young players to go along with the veterans,” Dameworth said. Outlook: The Spartans return 10 letter winners from last year’s squad. “We lost some key players last season, but there are some new players ready to contribute,” Morales said. “The return of a club player will help us fill the scoring void due to graduation. Outlook: Boman (17 goals, 14 assists) led the team in scoring last year and is one of nine starters returning for Coronado, which won the Sunrise Region title last year. Book (5.5 shutouts) is expected to see the bulk of the time in goal as the Cougars have to replace graduated standout Rachel Morris (13.5 shutouts). “We should be competitive,” Neel said. Outlook: Coming off a highly-successful regular season last year, the Diamondbacks return 10 letter winners, including some big weapons. Strellnauer (22 goals, 12 assists), Wood (13 goals, 13 assists) and Dunn (1 goal, 10 assists) return to lead the offense. Gato (6 shutouts), LeBoeuf (3 shutouts) and Gonzalez are back to guide the defense. “We hope to continue to play at the high level that we did last year,” Ogden said. “We are addressing the challenges that kept us from progressing further in the playoffs, and we hope to prove that we can be successful in postseason play. Outlook: The Jaguars return just four starters but are hoping to continue to show improvement. “This year we are continuing to build the program, allowing new students the ability to learn the game,” Gonzales said. Outlook: Shuirman (7 goals, 9 assists) and Sonerholm (6 goals, 4 assists) are among 10 returning letter winners on a young Crusaders team. “The Crusaders return a number of starters and welcome in a talented group of underclassmen as they look to again compete in Class 4A and possibly the toughest league in Nevada,” Morrill said. “The team only returns one senior, but will combine that with a strong junior class to build on a solid first season in the 4A. Outlook: The Falcons return four of their top five scorers in Carducci (7 goals, 6 assists), Bush (8 goals, 4 assists), Williams (5 goals, 5 assists) and Huff (4 goals, 3 assists). “With over half of last season’s team returning and the addition of new talent, we look to be competitive against schools in our region and improve upon last season’s record,” Simoneau said. Outlook: The Gators bring back 12 letter winners and are primed for a successful season. Bender (8 goals, 9 assists) and Madrid (6 goals, 2 assists) are expected to be among the leaders on offense with Sabol (3 shutouts) and Soifua guiding the defense. Outlook: McCoy had 12 goals and four assists last season and should be among the team’s leaders this year along with Eslava and Gennuso. “We want to win our division and do well in the playoffs,” Forbes said. Outlook: The Trojans’ record last year is deceiving due to having to forfeit the bulk of the team’s matches. Plenty of talent returns, led by the team’s top four scorers from last year — Dennis (14 goals, 7 assists), Kaitlyn Carrington (10 goals, 4 assists), Vitto (8 goals, 3 assists) and Niles (3 goals, 5 assists). “We have a strong group of girls who know how to play well and have a good ability to read their opponents and adapt accordingly,” Julie Carrington said. Outlook: The Panthers won the Sunset Region title last year and advanced to the Class 4A state championship match, but return only four starters from that squad. Hernandez (11 goals, 5 assists) and Johnson (7 assists) are part of the foundation around which Palo Verde hopes to build and be a force again this season. Outlook: Seven starters return for the Mustangs, who finished fourth in the Northwest League last year. Banks (8 goals, 3 assists), Villa (6 goals), Grant (5 goals, 3 assists) and Adame (4 goals) all are expected to provide some offensive firepower. Outlook: The Mountain Lions lost their top two scorers, but return seven starters from a team that advanced to the postseason. Kalaau-Sunia had three shutouts last year and will join Lasker and Zeigler as the leaders on defense. Costa (3 goals, 2 assists) is the leading returning scorer. “After the loss of some exceptional seniors, our developing underclassmen have big shoes to fill,” Muir said. “We are leaning on the returners to maintain the hard-working mentality that got them to the playoffs last year. Outlook: The Skyhawks return just four starters from last year’s squad. Farnsworth (8 goals) and Lommason (4 goals, 3 assists) should be among the team’s leaders this season. Outlook: The Eagles are making their debut as a team this year. “This year we hope to build on the foundations of a team capable of competing with other high schools in the state,” Andrade said. “As it’s our inaugural season in the NIAA, we’re looking to focus on and create a team that is dedicated to the sport, and shaping successful student-athletes that are proud to be an Eagle. Outlook: Hubbard takes over a team that struggled in its return to Class 4A last season, but is hoping for success this season. Outlook: The Roadrunners bring back nine starters from a team that advanced to the Class 3A state semifinals last year. Dody (7 shutouts) and Galindo are back to guide the defense. The offensive firepower could come from Webb (9 goals, 9 assists), Mestas (8 goals, 5 assists) and Zepeda (3 goals, 3 assists). Outlook: The Vikings bring back only five letter winners and hope to show improvement. Outlook: The Bulldogs return seven starters from a team that advanced to the Southern Region semifinals last year, but must replace the school’s all-time leading goal scorer in Abbie Barnum. A pair of midfielders and the team’s goalkeeper also graduated. “We will need to move some players into new positions to plug the holes left by graduation,” Snell said. Graves (7 goals, 18 assists) and Wright (10 goals, 5 assists) return and likely will lead the offense. Snell also is encouraged by what he said should be a strong junior varsity team this season and strong incoming classes for the next two years. Outlook: The Warriors bring back 10 letter winners from a team that advanced to the Class 3A state championship match last year. Marroquin (6 goals, 8 assists) had a solid freshman season and will be among the team’s leaders again this year. “Our goal remains the same as last year: Be the best team in Class 3A in November,” Sato said.